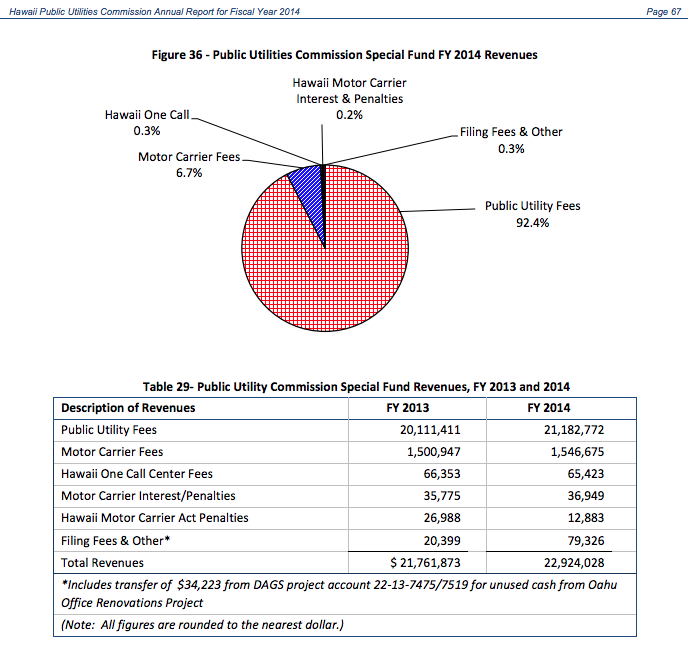 Yesterday, July 1, 2015, the Hawaii Public Utilities Commission (PUC) was officially transferred from the Department of Budget & Finance and is now administratively attached to the Department of Commerce & Consumer Affairs. What's the significance of this transfer? Hopefully, the PUC and its Chair will get better support to build its capacity and expertise as it tackles a number of complex issues. It has taken well over a decade to address the reorganization and modernization of the PUC through audits and legislative budget fits and starts. And, there is still more to be done such as completing the office renovation and expansion to accommodate a fully staffed PUC. Unlike other State agencies, generating revenue to cover its budget has never been a problem for the PUC. The problem has been keeping the taxes and fees collected from public utilities and other regulated businesses for its intended purpose, PUC oversight of these entities. Not unusual, in Fiscal Year 2014 more than 50% of the tax and fees collected were automatically transferred into the General Fund. 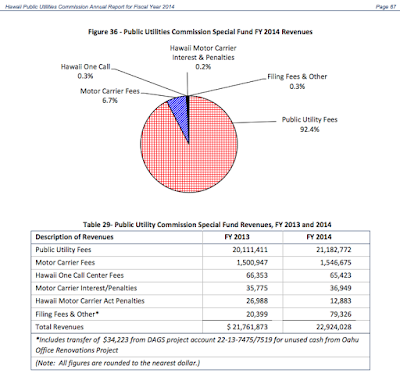 At the end of each fiscal year, on July 1, the PUC special fund is emptied out except for a $1,000,000 carryover. Most of the money collected is from the Public Service Company Tax which is set by the Legislature, therefore, there is little opportunity to make adjustments to the tax rate and amount collected, which is a cost borne by the ratepayer. I haven't been able to figure out how to link to a pdf so if the inserts are hard to read you can click here for the PUC Annual Report, go to pages 66-68 for these charts. More importantly, with regard to the HECO-NextEra merger, some have questioned whether the PUC was strong enough and had enough resources to effectively regulate HECO-NextEra. 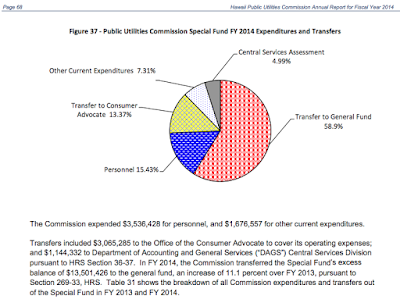 As you can see money is not the issue for a properly staffed and resourced PUC and Consumer Advocate. I have the utmost confidence in Chair Randy Iwase building the capacity of the PUC, and likewise for Consumer Advocate Jeffrey Ono. The real question is whether politicians will give both agencies the autonomy required for them to do their jobs effectively. Given the state of our island electric systems, guided by policy, it is physics, economics and information that will dictate a successful energy transformation to serve all customers, not politics. Yes, yesterday was a red-letter day for the PUC as it transferred from the Department of bean counters to a Department more familiar with the needs of business and the regulation of businesses. Recognition should be given to Senator Roz Baker who has, for more than a decade, supported, battled and presevered for the reorganization and modernization of the PUC in her role as the Senate Chair of Commerce and Consumer Protection.